Hameljuice is a three bedroom, two bath OBX vacation home with an open floor plan giving you a spacious living and dining room, with kitchen and bedrooms all on one floor. 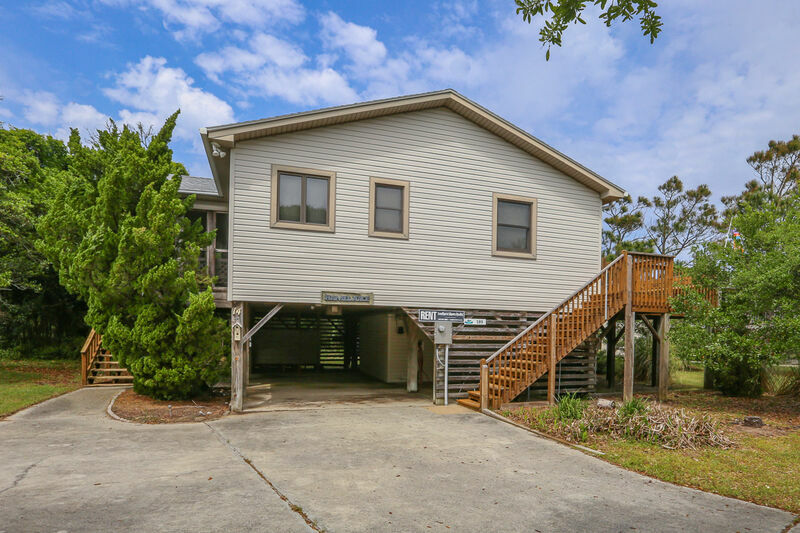 It’s a classic, “old style” beach home with wooden walls and charm located in the secluded, oceanside Seacrest neighborhood in Southern Shores, NC. The home is on a dead end street so no worries about lots of traffic, this is also a great spot for kids to ride bikes. The home has a spacious yard with shade trees for those hot days. Should you prefer the sun, Hameljuice has large decks with built in benches. There is also a large screened porch where you can sit and eat and enjoy the Outer Banks’ amazing weather and cool breezes. This rental home has large under-house parking areas plus an enclosed outdoor shower and a Weber grill. Hameljuice is only a short 270 yard walk to the beach. Along with all the home’s features, there is also access to community tennis, family park, basketball and soccer areas, sound access with a marina, and beach front parking for additional easy access. 3 bedrooms (1 with Queen with private deck access door) and 2 with 2 Twin beds in each) and a sleep sofa in the living area, 2 baths (1 with tub and shower, 1 with shower), and kitchen with double sink, microwave and dishwasher. There are 4 TVs (1 -50” flat screen in the living room, 1 - 32” flat screen TV in the master bedroom and 2 - 19” TVs in East and West bedrooms on rollers, also a large DVD library and internet access, ceiling fans and a fireplace. There is also deck furniture, beach chairs and umbrella to use. Hameljuice is centrally located between Duck and Kitty Hawk, so you are just a short drive to grocery stores, shopping of all sorts, dining (from fast food to 5 star) and many Outer Banks attractions like lighthouses, The Wright Memorial, wild horse tours, fishing charters, miniature golf, hang gliding, jet ski rentals, movie theaters and so much more! There is something for adults and children of all ages. Southern Shores Realty has been providing superb Outer Banks vacation experiences for over 65 years and we would love to help your family make them for many years to come!